Most FB breeders do not complain about the CBKC, the FCI and the cross-breeders. be the OFB which will undoubtedly bring badly to the FB. 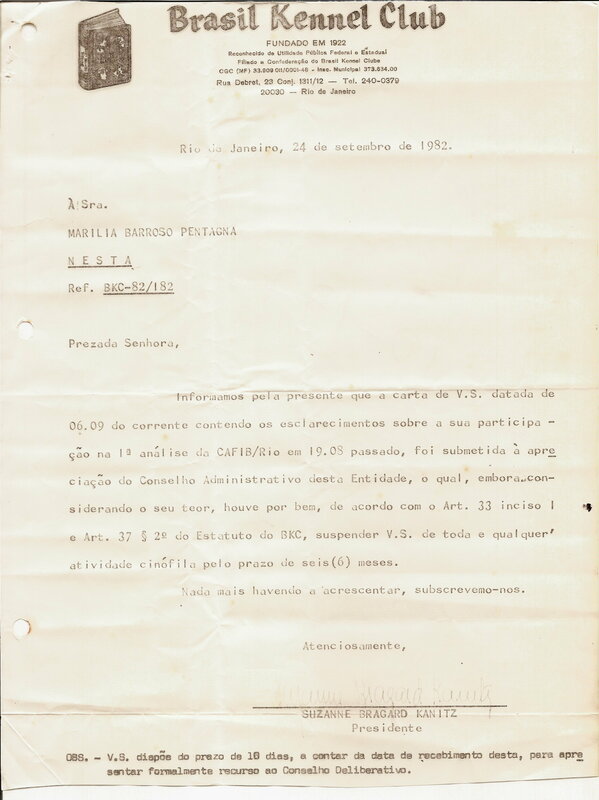 In my view, what happens with the OFB is the use of blood of Fila Brasileiro known for many years, whose blood lines exist and have been used for decades, registered in both the CAFIB and the CBKC-FCI, on the dogs called OFB whose phenotype and consequently also the genotype are inconsistent. In this way a genetic improvement of those specimens is sought. But genetic attachments are always present in individuals with this obscure basis, hence the black-colored dogs are accepted by OFB’s mentor’s. I understand, therefore, that it is a deception to capture the unwary and often the naive and well-intentioned. Unfortunately I have noticed the use of dogs of my lineage to validate this mistake. With regard to the aggression video dog (see in https://www.facebook.com/100000112667549/posts/2778218305525231/ ) , the same is yes of proven traditional origin and a dog that without more analysis seems to me of quality. 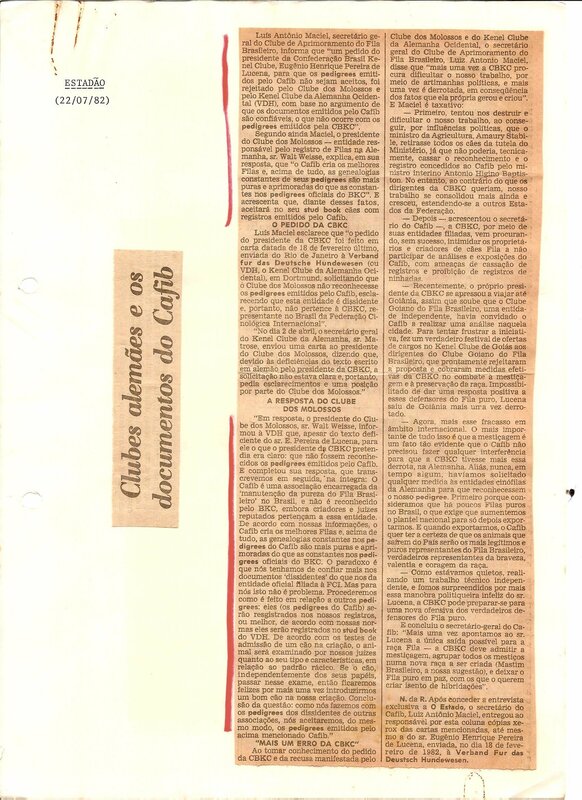 The same one was sent to Minas Gerais to be used by a group, and one of the members, who are enthusiastic and supportive of the OFB, try in the video to copy a video posted by OFB. In my opinion, if the fashion takes, we will see dogs attacked cowardly frequently and criminally. This is a fact that repudiates and does not compromise in any way. With my sincere wishes for a Happy New Year! Uncle Chico’s Response: Unfortunately, I fear that you are covered in reason !!! But it’s me who thanks your link and comments. My duty was to disclose them, questioning the points which I do not know. 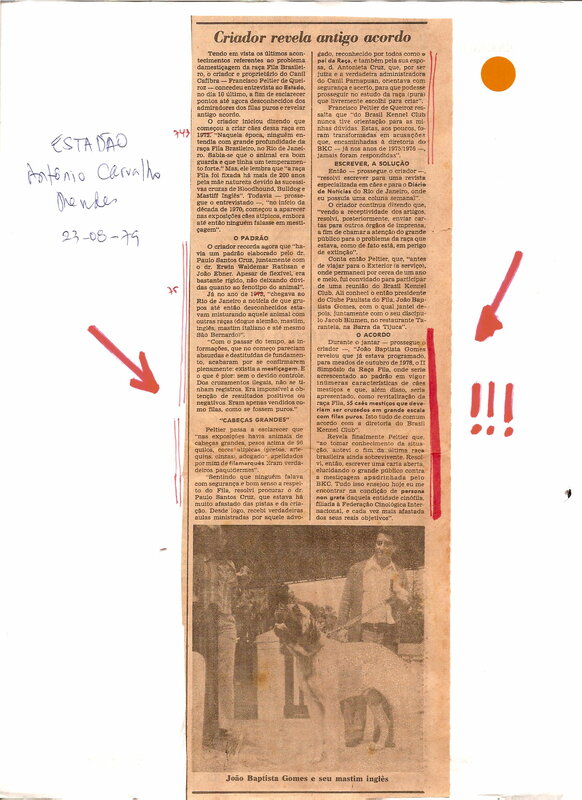 But I believe that the greatest evil in the FB breeding has always been the silence of the great majority of serious, honest and Typical Fila breeders of the CBKC-FCI, especially the SPFB leaders and members, who never complained and gave their testimony about the FB miscegenation, never questioned a judgment where a “mestizo-fila” or “black-fila” had won a prize and never questioned the CBKC-FCI imposing that these two clubs to respect their own Statute that only permits the breeding of pure-bred dogs ( see in the FCI site http://www.fci.be/en/FCI-Statutes-39.html). This silence began in the 70’s with the advent of miscegenation and the making of the so-called “black-fila“. 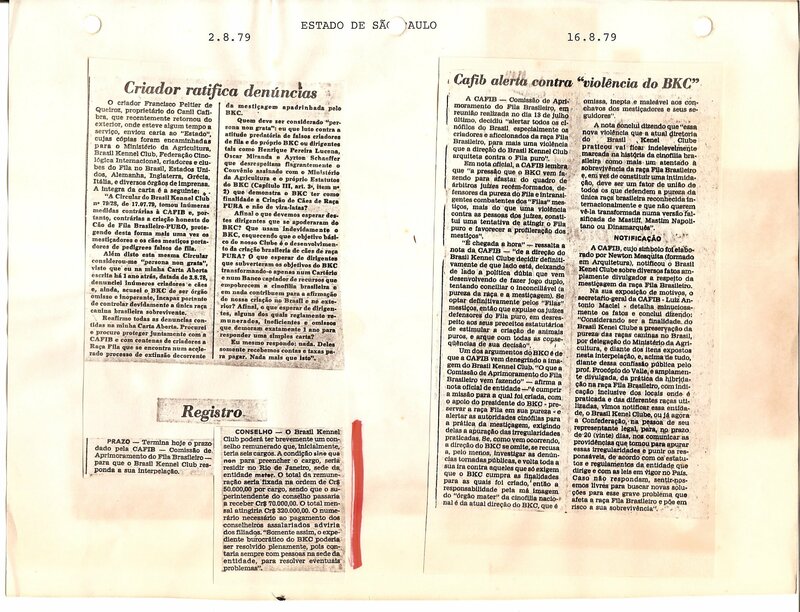 Then with the continuation of the breeding and registration of “filas” to date in the CBKC-FCI and the consequent proliferation of dozens of heterogeneous types of the so-called “mestizo-fila“, even called “freak-fila“. 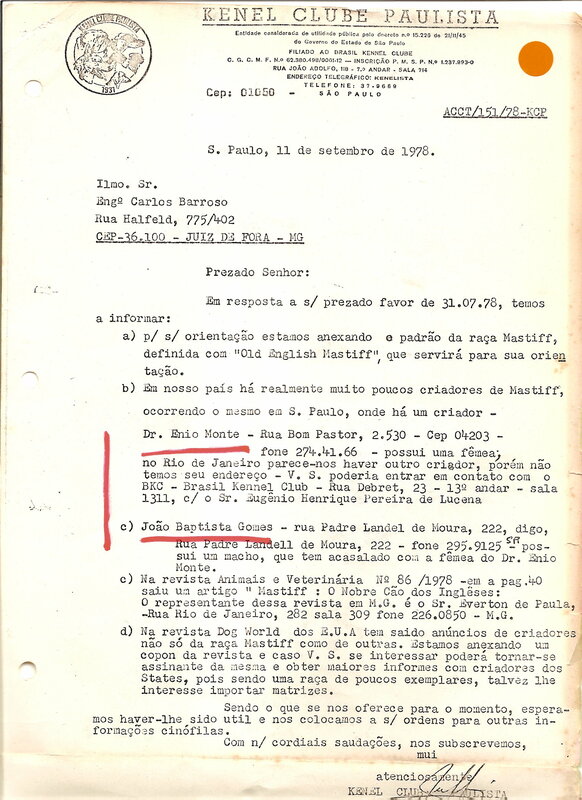 The same silence and lack of complaint prevailed more recently, when 3 people from São Paulo State and one from Piauí State tried to reinvent the “black-fila” and, a few months ago another guy from São Paulo wrote that he wants to reinvent the “black-fila” and now the one of OFB in Minas Gerais. But unfortunately since the 1970s the overwhelming majority of FB breeders remain in complete silence for fear of complaining and questioning why miscegenation and pedigree falsification persists and also the heterogeneity of FB pedigree dogs issued and sold by CBKC-FCI. 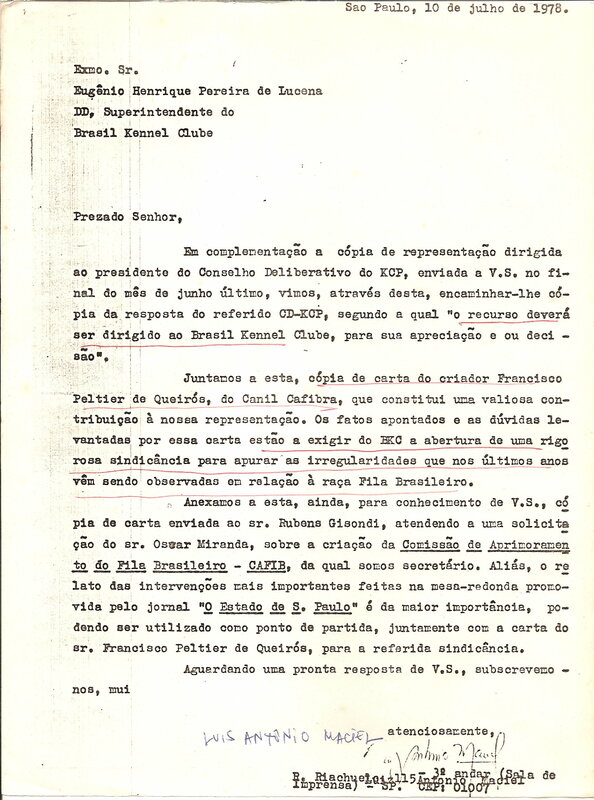 To the best of my knowledge, the only voice that has systematically and consistently argued against miscegenation, the cross-breeders, their heirs and followers against BKC, CBKC and FCI and publicly denounced this crime was Uncle Chico from 1975/76 and the founders, directors and members of CAFIB from 1978. 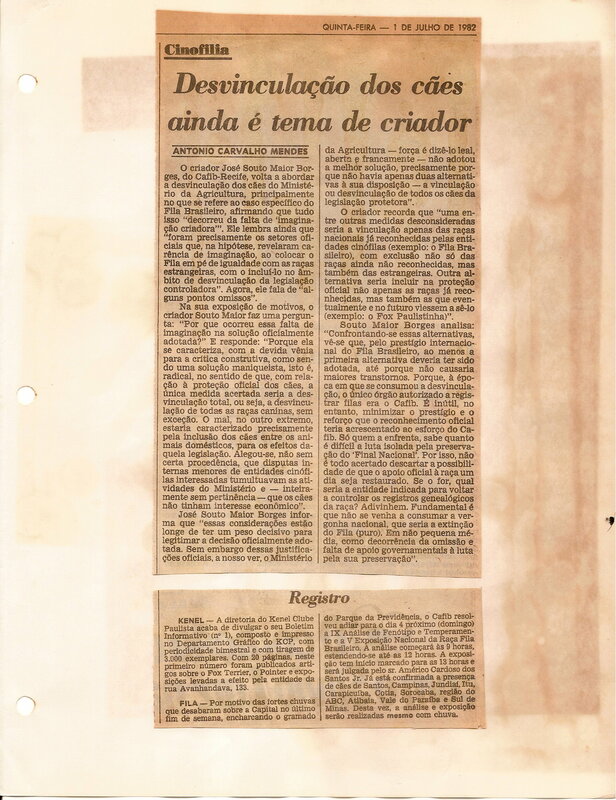 It should be emphasized that since the beginning of our struggle against miscegenation we have always had the support of the two most important Brazilian newspapers of the time: Jornal do Brasil, through the weekly columns of Paulo Godinho and O Estado de São Paulo, through the weekly columns of Antonio Carvalho Mendes. 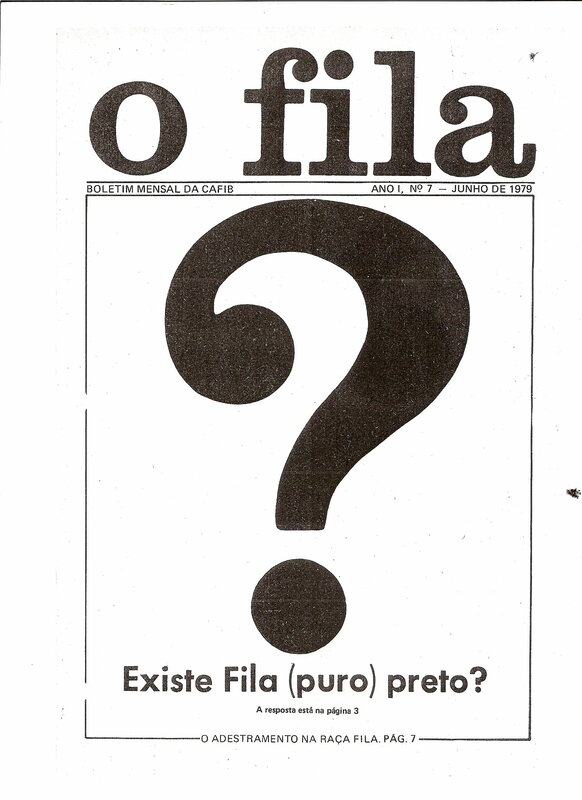 Recalling that the journalist Paulo Godinho wrote the exceptional book titled “Fila Brasileiro: A Gift from the Stars” (link to get the book from is HTTP://blogdopaulogodinho.blogspot.com or by email paulogodinho@ique.com.br , which registered on page 368 of his book: “Nothing is more mestizo than a black fila“. 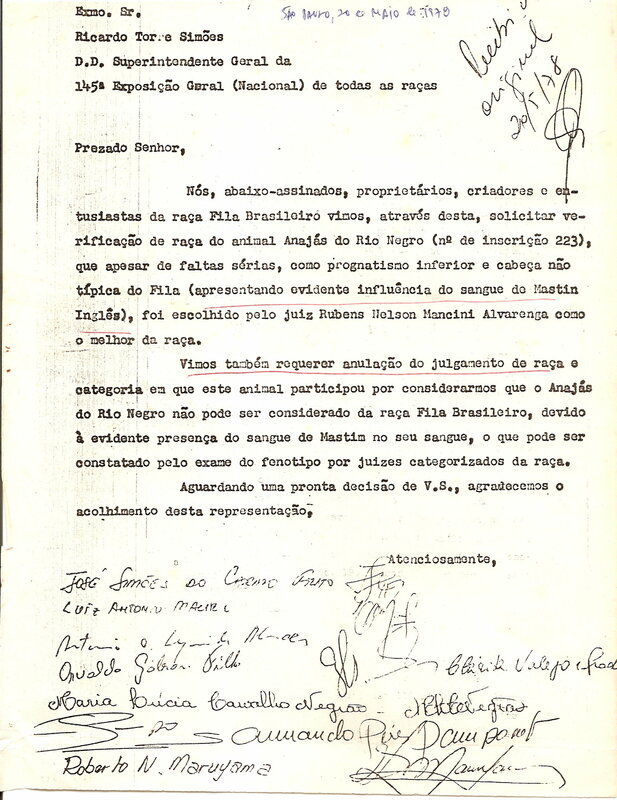 In addition to the compelling sample above, I recall CAFIB’s Journal O Fila (see http://www.cafibbrasil.com/ofila.html ) and that my site and blog have more than 1,000 documents scanned from 1942, almost 700 articles signed by me and more than 2 thousand photos of PURE Filas, “mestizo-filas “, “black-filas” and, more recently, some OFBs. 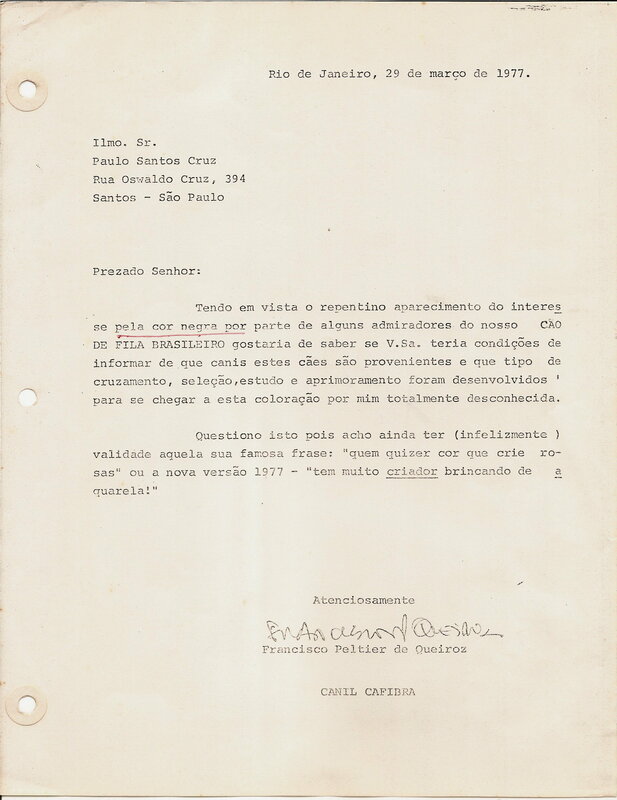 So I think that fools, lazy people who do not like to read and study the True History of Fila Brasileiro, the functional illiterates and the guessers in “fila” on duty who frequent several Facebooks just did not learn why they did not want to. 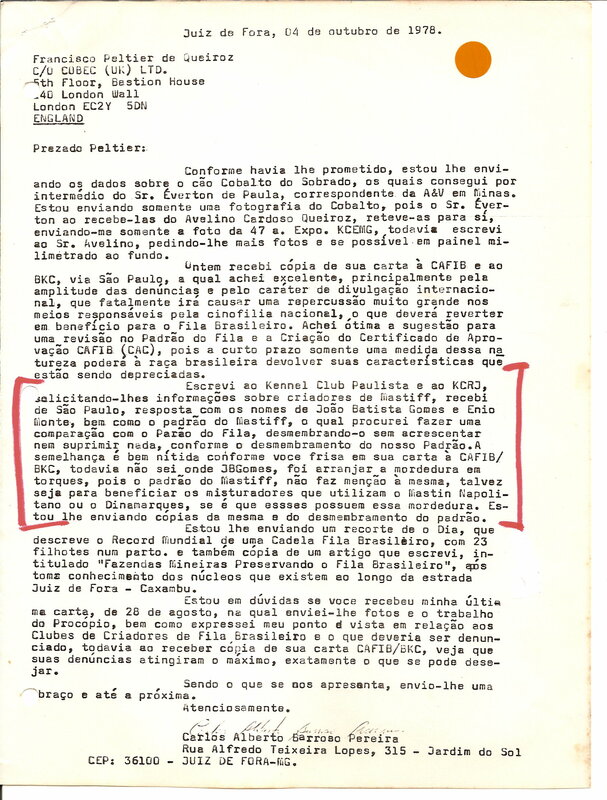 Therefore, I truly believe that while the serious and honest breeders, especially those who register in the CBKC-FCI, do not denounce the various forms of miscegenation still present today and do not defend the Pure Fila this disorganization in the Fila Brasileiro breeding will endure. 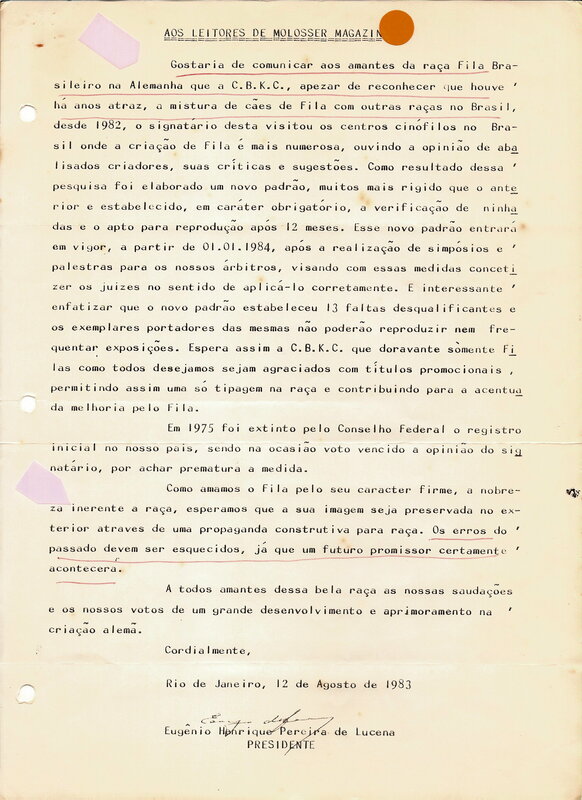 Even why many Brazilians do not like to read, study and willingly accept any novelty as stupid as it is. Worse: they thinks that those who complain are just annoying and not a citizen who defends morals and ethics in the FB breeding. 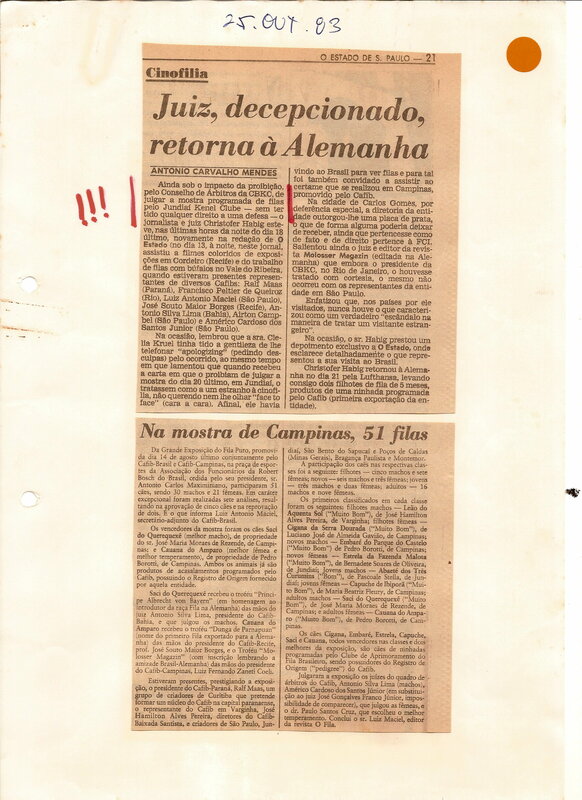 But Brazil is changing. 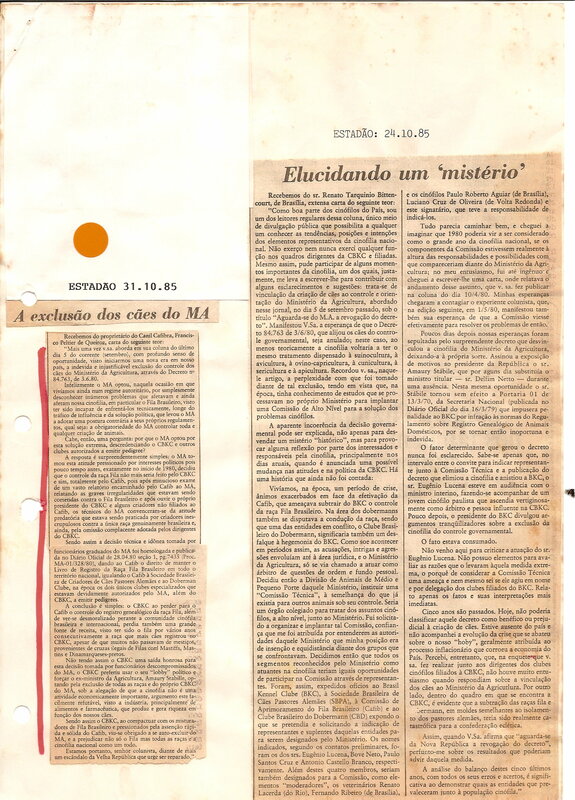 That is why I have opened my blog to the articles of those who truly intend to defend the Pure Fila publicly. Unfortunately, as long as most serious breeders do not expound their thoughts on the FB miscegenation, stop registering their dogs at CBKC-FCI, stop attending their dog shows, and strongly urge CBKC-FCI to only register pure-bred dogs as determined by their own Statute, miscegenation and foolishness will not end in the FB breeding registered in CBKC-FCI. Have a Happy 2019 !! !